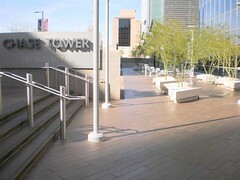 Pressure washing technicians have spent the last few weeks cleaning pavers at Chase Tower in Phoenix, Arizona. The pressure washing service prepared the surface for sealer application. 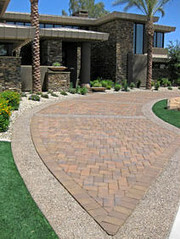 Sealing paver surfaces protects them from stains and spills and enhances the colors of the pavers. Our mobile pressure washers are always in the downtown area if you have a project that requires some expert pressure washing services. We are available 24/7/365 and you can get a free esimate by calling 602-373-1515! 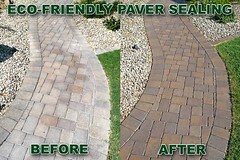 Please visit Phoenix Paver Sealing for more information regarding the cleaning and sealing of paver services in Arizona. The site has some helpful information about the benefits of sealing concrete pavers and a little about the processes involved in achieving the best results for your paver project. There are also a variety of photos of different pavers we have sealed including some excellent before and after photos showing the results you can expect from working with a professional paver cleaning and sealing company like ACME Powerwash. Last weekend, ACME Powerwash participated in the 3rd Annual Eco-Expo at Encanterra in San Tan Valley, Arizona. An environmentally friendly sealer was showcased that is used on concrete and pavers in the Phoenix area. This water-based sealer exceeds all EPA and VOC standards, making it the perfect choice for “Green” projects throughout Central Arizona. This photograph is an excellent example of the enhancement created by sealing your pavers. There are other unseen advantages including protection from stains, salts and other corrosives, uv rays and locking in joint sand which discourages weed growth and ant hills. The applications of these eco-friendly sealants include pavers, concrete, exposed aggregate, stone, etc. 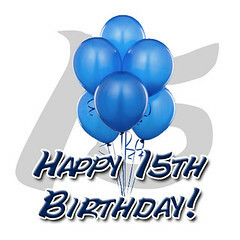 For a free estimate please call 602-373-1515. 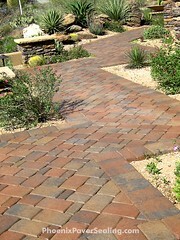 For more information on commercial or residential paver sealing in Phoenix, please visit http://www.acmepowerwash.com/coatings.html.